Emerald City Tangles | Tangling in the Land of Oz! 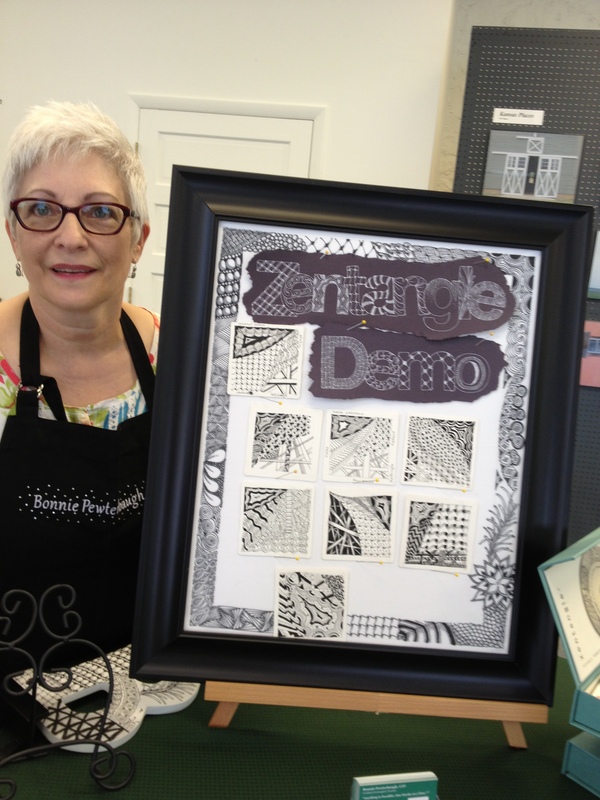 SCROLL DOWN TO LEARN ABOUT THE BENEFITS OF ZENTANGLE!! Hi, I’m Bonnie Pewterbaugh, Certified Zentangle Teacher! Here I am, in the Emerald City, and I’m tangling away, creating Zentangles! I came across Zentangle one day while surfing the web and I was hooked! As the first Certified Zentangle Teacher in the State of Kansas, I offer a variety of workshops so you, too, can experience the Zen! Read my latest blog and check out my website to learn more about me, where I’ll be teaching workshops and a gallery of what can be created. Contact me at EmeraldCityTangles@yahoo.com or 316.253.8899 if you are interested in personalized workshops for yourself; or group workshops for your organization that focus on team building, fundraising, etc. Zentangle ® is an easy to learn method of creating beautiful images from repetitive patterns. It is a fascinating new art form that is fun and relaxing. It increases focus and creativity. Zentangle provides artistic satisfaction and an increased sense of personal well being. Zentangle is enjoyed by a wide range of skills and ages and is used in many fields of interest – Maria Thomas and Rick Roberts, Zentangle Founders. Zentangle in its purest form is “tangles” or patterns created on a 3 ½-inch x 3 ½-inch (89 mm x 89 mm) square card of fine, individually die-cut Italian Fabriano Disegno printmaking paper, selected for its texture and archival characteristics. Archival quality Pigma ® inks produce images that will stand the test of time. took my first class and loved it THANK YOU BONNIE Hope to see you soon!! Terry I left class feeling like an artist!! Took my first class yesterday. Bonnie is an excellent teacher, very patient and ready to share her knowledge and expertise. Would highly recommend her class to anyone. Do we have any color options on the kits we will be supplied with the evening of the class ? The Beginner Zentangle Workshop is black and white only. This workshop will provide you with a beginner kit and the tools to move forward in the Zentangle world. You’ll learn a little bit about the history of Zentangle, the differences between Zentangle and ZIAs and doodling. Color certainly plays a part and we will discuss that as well, but the project for the evening will be completed in black and white (with just a touch of red for Valentine’s Day).